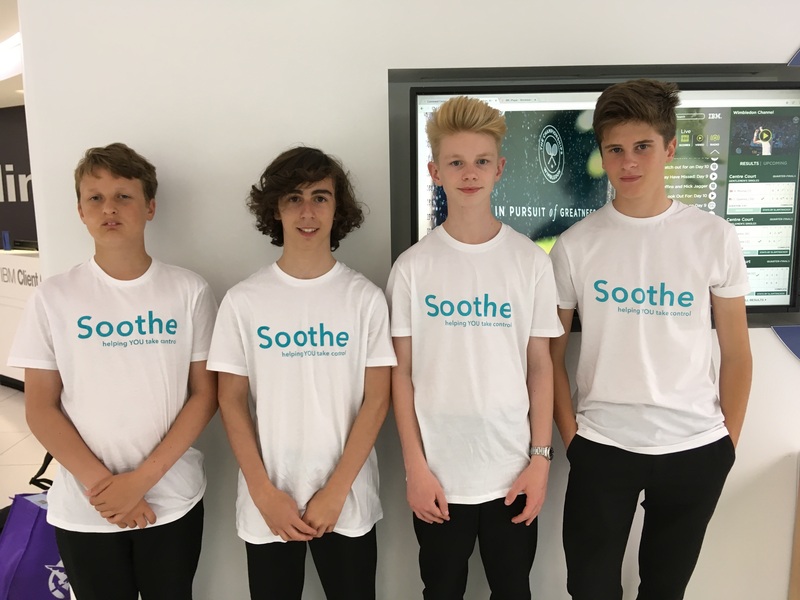 Four students from Bodmin College won a place in the finals of the IBM/Nesta Longitude Explorer competition with their concept “Soothe”. The students consisted of 4 year 9’s – Liam, Thomas, Goncalo and Aidan. Soothe is a system that is designed to assist with panic attacks, something that affects a large percentage of the population. They decided to focus on veterans as one of the main constituents of PTSD is Panic Attacks and these can be extreme having a massive negative effect on the lives of ex-service personnel and their families. The system consisted of a wristband that monitors a person’s stress level, if a panic attack is detected then this would trigger a breathing meter to be activated on the wristband. This would be combined with a phone APP that would allow the user to select soothing videos, images and music to play on their phone in conjunction with a breathing meter in order to help them to relax and gain control again. The other feature of the system was to allow the user to control the home. The APP would allow them to configure what the user wanted to happen in the home when they had a panic attack. It could be configured to change the lighting, switch on a scent or turn on any electrical appliances. The students went to IBM headquarters in April and were briefed on the IBM tools that might help them to bring their ideas to life. On their return to college the students worked extremely hard to bring the idea to life. They had to complete an extensive workbook, make a presentation, create promotional materials in conjunction with developing the actual software and hardware in order to make this a reality. We returned to London on the 13th July for the final, competing against 9 other teams from schools around the country. The boys gave a fantastic presentation that really shone with its level of professionalism. They were the only team that demonstrated a functioning solution utilising the IoT (Internet of Things). The team came second winning £1000 for the school and prizes for themselves. This is a fantastic achievement in a National Competition. Well done lads! !